In this series, I aim to teach you to recognise the recycled denialism that is rife in the public arena these days. I don’t refute this nonsense by constructing a new argument each time which, point-by-point, shows why their claims are not supported by the evidence. This is pointless, since the majority of non-greenhouse theorists (‘pseudo-sceptics’) blithely ignore any such counterpoints and simply repeat the same arguments elsewhere. Instead I rebut by hyperlinking to some of the wealth of explanatory material out there on the world wide web. For reasons of general accessibility, the articles l link to are predominantly pitched for a lay audience – but they are consistent in linking to the peer-reviewed primary scientific literature (sometimes I’ll link straight to the journal papers). I focus primarily on the science content of the piece, except where non-science arguments are clearly false and demand correction. Some of my colleagues disparage the IPCC warnings about global warming because they say the models do not use a sufficient range of economic assumptions. Please would you tell me where can I find a table (not a figure) of the lowest tropospheric CO2 concentration (presumably derived from the emission scenarios) for each year or decade used as an input for the 23 (?) different IPCC models in the 2007 report. I have spent hours searching the web and the IPCC reports without success. Open letter to Ian Plimer. I enjoyed your book Heaven + Earth, and your considered discussion of the possible causes of climate variability of the age of the earth, even though it was at times a much repeated list of facts and message, but why dissipate your scientific facts and scholarly quotes from the literature with so much religious preaching? Your religious proselytizing does you no credit. You often mention caustically in name or in general those who zealously preach with hidden agendas and twisted use of the truth. Unfortunately I’m left wondering why you watered down your science with religious, pious, inappropriate innuendo and non-scientific pronouncements involving religious beliefs. As you don’t say why you do this, I’m left to speculate. Maybe you want to ingratiate yourself to some hierarchy of true believers, or be a papal knight, or feel guilty and in debt to your God for previous sins, or have some other agenda. How could I or anyone know what lead you to mix your religious faith with the hard science you base your major arguments upon? It was a weird thing to do. You have succeeded at the moment in making me a climate change fence-sitter yet to make up my mind, but I’m not just sceptical of the other side of the debate, for I’m also now skeptical of your agenda as well. The many criticisms of your book’s accuracy which several have addresed in print are concerning, and makes me wary of your data. It leads me to not have faith in your dogmatism. Your religious advocacy makes me very wary as well. You may not care if readers find your message mixed. Maybe you feel superior and vindicated already, though you seem to despise others who think themselves superior, so hopefully not. I think it was a very big mistake to dilute the science you so heartily believe in with your religious views. Having accused your opponents of allowing non-scientists too much say and power in the debate you talk about God and the spiritual life, and lie down in bed with non-scientists like a cardinal and a pope. Dumb, dumb, dumb. “…pagan emptiness and fears about nature have lead to hysteria and extreme claims about global warming…….Today they [pagans] demand a reduction in carbon dioxide emissions.” [George Pell]. So are those opposing you are all pagans, or only some of them? Pathetic type-casting, isn’t it. “It is important for assessments in this regard to be carried out prudently, in dialogue with experts and people of wisdom, uninhibited by ideological pressure……” [Benedict XVI]. Pity he doesn’t use the same impartial rules of thought in coming to so many other absurd proclamations, edicts and dogmas! By his own definition and yours he is a hypocrite in thousands of ways. Why quote a pope (a religious fanatic by definition) as a final arbiter at the end of your science book? You quote two men who do all they can to perpetuate many things that many abhor, including vocal and powerful efforts to stop all contraception, including condoms in AIDS-rife parts of the world, thereby helping condemn a countless number of gullible, guileless people to a horrible death, their families to suffer without parents, or the children themselves to die painfully. Do you find this admirable? No-one of course can be assumed to also hold all the beliefs of those they quote once or twice in other contexts, but, how is a reader to know when you choose to quote religious figures from the Catholic hierarchy in a science debate? Pell has previously talked of evidence that shows contraception doesn’t stop HIV infection, using the type of poorly conducted “science” you claim to abhor. Have you aggressively corrected Pell on this, or do you agree with him? How is a reader to know? “The global warming movement has a collective of prejudices with a perceived moral ground.” I agree about much you say on this. However, by association you lump all who fear global warming in with those who are “environmental romantics” who “hate industry, love Nature, idealise peasant life, believe capitalism is wicked, think people in modern society lead depraved shallow lives and have forgotten the true meaning of things, don’t like cars or supermarkets and hate the average person taking cheap long hauled flights to warm areas on holidays.” etc, etc, etc. The vitriol is palpably vivid. I don’t believe the majority of concerned people are in this mould you describe. You are as guilty of collective generalizations as any of your opponents. You also accuse opponents of being spiritually shallow. How woefully judgmental and shallow of you, accusing from your own moral plateau on high. “Mother Nature does not build gardens of Eden..” you say, though of Australian Christians 38 per cent support Genesis according to the recent Nielsen poll (so it isn’t just nutty Americans) and another 47 per cent favour the God of Design; only 12 per cent of Australian Christians believe in Darwin’s theory of natural selection. Australian Christians may believe the bible is all literally true (25 per cent), 52 per cent put their faith in telepathy, clairvoyance, psychic healing, etc., 41 per cent believe in telepathy, 32% in UFOs, 35% believe in witches, and the list goes on in the poll! And you accuse atheist environmentalists of shabby thinking!! You should keep atheists on side, as so many scientists you hope to convert to your anti-global warming side are also atheist. Remember creationist Christians here in Australia and elsewhere won’t believe your facts and dates, so won’t support you, unless very confused in their beliefs. Mock atheists spiritual worth and depth if it makes you feel superior, but don’t be surprised if some or many take exception to your pathetic moralising in this regard. You talk of “the urban atheistic religion of Environmentalism.” Environmentalism from the dictionary means: “advocacy of the preservation, restoration, or improvement of the natural environment; especially: the movement to control pollution”. No mention of all your add-ons. Perhaps your vitriol here is as much against atheism as environmentalists! You seem to be running a not so subtle background agenda here, advertising and pushing some of your religious views on your readers, which is bizarre, irrelevant to your scientific message and an absurd distraction from your data against the global warming movement. You may feel “Religion is not about pie in the sky when we die, it is about the present” but many feel it is ultimately based upon pie in the sky ideas, created by human minds for human societies, and has no factual basis. Religion is many things including a tool used to create moral codes, but if the basis is myth and is still mistakenly being espoused and perpetuated as true then it should be exposed as being based upon falsehoods, or at least recognised as probably or possibly being so. But then, that would be too open-minded for a religious zealot to admit. At these times you sound like the pot calling the kettle black. You say “Some pseudoscience, such as creation “science” is the fruit of an unsound mind.” Many would also say all or much religious belief is the fruit of unsound minds. It isn’t relevant to this scientific debate however, unless thrown into the debate, yet you have thrown religion into your book with gusto for unknown reasons. Why ruin your direct scientific message with religious claims that can’t be scientifically proved? You quote “It is useless to attempt to reason a man out of a thing he never reasoned into” [Jonathan Swift], but this also aptly describes most religious belief which rests on faith not reason. You speak glowingly that “Carl Sagan argued that science is the candle in the darkness..” Sagan also said of religion “You can’t convince a believer of anything; for their belief is not based on evidence, it’s based on a deep-seated need to believe. Life is but a momentary glimpse of the wonder of the astonishing universe, and it is sad to see so many dreaming it away on spiritual fantasy.” And you accuse others of selective quoting! Why not quote Sagan on religion if you want to make the end of your book a religious discussion. You blithely choose to end your book stating “Human stupidity is only exceeded by God’s mercy, which is infinite” yet you spend your book continually lampooning those who make statement with religious zeal and fervor. How hypocritical is that! Surely you should qualify this, and admit that God may not exist let alone be infinite in anything, or may not be this supposed wondrous, personalised deity. Many who see suffering throughout the world and over history or experience suffering personally think any such Being could not exist due to all the contradictions it would involve. God as many construct him may not be possible. Many think any such Being would surely be either an imbecile or uncaring or malevolently evil. Where is your scientific qualifier? Perhaps you should mention Occam’s Razor could apply to religious beliefs including all or most of the extraordinary and impossible claims within Christianity. I’m mystified as to why you as a scientist personally believe in religion which involves so much “mystery, magic and miracles”, without any proof or scientific evidence. You presumably also believe in a second coming (though are modest enough I presume to not know the date, unlike religious believers you quote from the past). All the prophesies of the end of the world that you quote I’d guess are from religious believers. The Inquisition and other dogmatic societies and courts, which you mention as being similar to the dogmatic approach of the horde of current climate change believers, were misguided religious institutions and groups. Religion has a lot to answer for along with any of its good points. Maybe you should be fair and point out all the flaws of religion while you are so busy proselytising. But then, that would be balanced, and religious zealots invariably decry such an approach. Interesting science, but pathetic preaching better left to The Catholic Weekly than in your (mostly scientific) book. Your religious beliefs fail Michael Schirmer’s list of fallacies that lead people to believe weird things, or are you too blinkered to see that? I object to being labeled a “denier,” or a “denialist,” or any other word that uses a root word reference to “Holocaust denier” to demonize their opponents. That those individuals believe they must use a hate label like “denialist” shows that they lack the facts necessary to prevail in the AGW debate; they have lost the argument before they started. It is no different whatever than someone labeling their opponent with the n-word, when debating an African-American regarding race relations. “Denier” is equally objectionable. Actually more so, since the numbers of jews, gypsies and others tortured, robbed and murdered in the Holocause far exceeds the number of African Americans subjected to the same treatment. The proper term is scientific skeptics; shortened to skeptics if you like. The scientific method, which has provided enormous benefits to humanity, has its entire basis in scientific skepticism. It is the reason we don’t go to witch doctors to treat diseases. Skeptics deny nothing. Skeptics simply say, prove it. Or at least, provide solid, testable, falsifiable evidence showing that a rise in CO2 will cause runaway global warming and climate catastrophe. Ever since the leaking of the Climategate emails, including the Harry_read_me.txt exposé showing the rampant corruption of the AGW purveyors, including the outright fabrication of temperature data sets, [including one invented temperature data set spanning 13 years], the CO2=Catastrophic AGW hypothesis has been on the ropes. Phil Jones is not out of a job for no reason, and Copenhagen [COP-15] didn’t fail for no reason. Those are the direct results of the release of the damning evidence of the rampant corruption within the climate sciences. Their weak response: labeling scientific skeptics – who are simply requesting, per the scientific method, the sharing of data and methodologies used to come up with the catastrophic AGW hypothesis – as “denialists.” Name-calling is not an argument. In this instance, it is desperation. That is not just a thoroughly objectionable label by venomous believers in a repeatedly debunked conjecture. It demonstrates the failure by the promoters of the preposterous belief that a harmless and beneficial trace gas, comprising only 0.00038 of the atmosphere – one molecule out of every 2,600 – will cause catastrophic climate change. Past CO2 levels have been twenty times higher than current levels, for hundreds of millions of years at a time, without causing runaway global warming. In fact, during those times Ice Ages have regularly occurred. The debate over AGW will begin to sound credible when and if the believers in their hypothesis stop the objectionable “denier” name calling. That would substantially limit the emotional content of the debate, and allow the facts to be discussed dispassionately. But perhaps the AGW purveyors don’t want to discuss the facts, for the obvious reason that they have been unable to show any empirical evidence whatever that a quantifiable increase in CO2 leads to a measurable increase in global temperature. They are left with the comfortable alternative of scurrilous name calling – a sure sign that they have lost the scientific debate. You do understand, surely, Smokey that Climate Change Denialism refers to denial of climate change, whereas Holocaust Denialism refers to the Holocaust? there is an inner logic to AGW denialists and Ayn Rand anarcho-liberals such as Smokey (see his effusions on another BNC thread) objecting to the term denier, Matt. The CONUS import figures show ever-growing CONUS dependency on Muslim oil, which is why thoughtful US persons eg Robert McFarlane (ex security advisor to Ronald Reagan) have wanted to reduce it. The terrestrial US aircraft carrier near Cyprus on 24/7 watch is the USS Israel. Its legitimacy as a colonial settler state hosting US sweatshops and riding herd on those Muslims has been promoted ever since the first Likud govt. in the 70s by equating any criticism with anti-semitism (compare the situation before 1977, when Israelis were in fact ashamed of the Holocaust and disparaged its victims, cf. historian Tom Segev). So anarcho-liberals are justified from their standpoint in trying to reserve denialism for the political interests of their favourite piece of hardware, anchored in the Med. That Smokey has no clue about palaeoclimate C02 evidence and prattles on, like all AGW deniers, about “inaccurate computer models” is as boring as these people always are. That he poses as a good friend to blacks (current PC term this season: African-Americans) and other minorities and uses the New Right term “hate label” merely shows how flexible Capital can be: like a snake, it sheds the skin of its previous pre-1990 racism and misogyny, etc. If you look up at the top of the right hand sidebar, you’ll see a link to the blog owner’s Audio/slides for Climate Change Q&A. If you would like to have your position heard sympathetically, perhaps you should go through a couple of the podcasts and related slideshows to find demonstration points for your case. After all, if the scientific case is so flimsy, you should be able to find something questionable without much difficulty. So now ‘denialism’ is capitalized?? My feelings are hurt… NOT. I understand that you, like your kissin’ cousins above and below, deliberately use a word that is rooted in the WWII Holocaust. Yet, when called on it, you refuse to man up and admit what everyone can see. Such bravery. The Big Bang, for example, is not proven cosmology. Yet those who don’t believe in it are never labeled “denialists.” And the majority who disputed plate tectonics never labeled those who thought the hypothesis was valid as “deniers.” Ignaz Semmelweis was never called a “denialist” for advocating hand washing. Pasteur was never called a “denier” for disputing the belief that life sprang from dead earth. Einstein was never called a “denialist” for disputing Hubble. I could cite dozens of similar instances. The insult “denier” and its permutations is an invention of climate alarmists, who use it in place of verifiable evidence. As a matter of fact, the use of the pejorative “deniers” is deliberately used to equate those who refute CAGW [catastrophic AGW caused by CO2] with Holocaust deniers. To deny that plain fact is mendacious and cowardly. Or possibly ignorant… surely, you can not be that stupid? Can you? Deliberate name calling is the sad refuge of unscientific laymen, steeped in the soft humanities and ‘social sciences’; lockstep gorebots programmed by the media, who can not understand how decisively climate sensitivity falsifies their CAGW belief system. Nor can they understand the fact that as harmless CO2 continues to rise, the planet continues to cool: click. When the planet itself laughs at your hubris, you are on the losing side of the debate: who are you gonna believe? Al Gore? Or planet Earth? Next, after Peter Lalor gets done with his wild-eyed, spittle-flecked, crazed world view, and before his ranting about long outdated 60’s era racial politics [he must really be a fun date], and after the obligatory “denialism” name-calling, he shows conclusively that I have forgotten more climatology than he will ever learn: I spent my entire education and career working in the science of weather and climate instruments, in design and calibration. I received all the peer reviewed literature, courtesy of instrument manufacturers, from a time well before the words ‘global warming’ were ever seen in the mainstream press. I’ve watched first hand as the AGW scam morphed into a monumental tax grab, guided by rent-seeking scientists, bought and paid for by ever escalating government grants – which were never given to scientists skeptical of the effect of human activity on the climate. Purveyors of global warming catastrophe received enormous government grants [totaling over $50 billion during the past decade alone! ], while skeptical scientists had an extremely difficult time even getting their well researched papers published. The climate grant system has been gamed. And of course, Mr Lalor is wrong. Anyone who cannot spell paleoclimate, and who uses C-zero-2 for the carbon dioxide molecule CO2, is simply a poseur; a pretend scientist. So I’ll move on to someone who might have a clue. But first, to verify my charge that computer models are inaccurate, and to easily refute the helpless Mr Lalor, who is clearly out of his depth and suffering from Festinger’s cognitive dissonance, let me point to the abject failure of computer climate models to predict anything of substance: click. Note the truly pathetic accuracy scores. A series of coin flips would be much more accurate. Finally, Mr Finrod, at least, tries to have a substantive conversation. I applaud him for that, although I must decline his offer to view this blog’s climate alarmist propaganda. If I want to be spoon-fed climate propaganda, there is always the thinly trafficked realclimate. But my thanks to Mr Finrod for the kind offer, and for his refusal to use the d-word. And how do I know it’s propaganda? Because what started out as “global warming” then morphed into “anthropogenic global warming.” Then the goal posts were moved once again, and AGW became “climate change,” in order to blame the evil human race for CO2 emissions – which are actually more than 95% natural, according to the IPCC: click. Note that for every 34 CO2 molecules emitted in total annually, 33 are emitted by completely natural processes, for every one emitted by human activity. In fact, the planet’s natural year over year variation in CO2 emissions is significantly greater than the puny amount emitted by all human activity. Scientific skeptics understand that over the past 4.6 billion years the climate has constantly changed. Despite Michael Mann’s repeatedly debunked claim that the climate remained essentially flat over the past 1,400 years, with no LIA and no MWP, scientific skeptics understand that the climate always changes and always will. That is why Mann’s Hokey Stick chart was so thoroughly debunked by McIntyre and McKittrick, whose conclusions were then verified by Wegman, et al., in their report to Congress, and why Mann’s hokey stick chart is no longer used in the IPCC’s Assessment Reports: it is fraudulent, based on selectively chosen, thousand year old “treemometers” that he claims can show one-tenth of a degree temperature changes from year to year. As if. Still, I suspect a few here would believe such incredible globaloney. And that does it for my educational attempts here, folks. I don’t wish to waste more time on a blog that is a name-calling echo chamber for folks still living in their mom’s basements. You may all have the last word, and continue to call me a “denialist,” or whatever name takes the place of rigorous thinking regarding the repeatedly falsified CO2=CAGW conjecture. Have at it, and good day. How should we interpret your comment, Smokey? Are you saying that there is a natural rise in the CO2 level which is not having the effect claimed, or are you saying that fossil fuel combustion is not causing sufficient CO2 emissions to result in any rise in atmospheric CO2 levels? If the latter, you may be on shakey ground (to put it mildly). Smokey – why don’t you come up with something original instead of re-hashed comments from other pseudo-sceptics (do you like that description better)? You are so boring that I might have to give in and have a Sunday afternoon snooze. Yawwwwwwwwwwn! the late 20th cent.scientific evidence about AGW predates research into it receiving funding other than that normal in university research grants for natural science. That is, when Hansen spoke on AGW before US Congress in 1988, “global warming” was not in the public domain at all and thus not a phrase with which to gain public funds. Or were you crawling around in nappies/diapers in 1988? Getting ready to misquote the Latin tag “per se” as “per say”? You can write “financial reward” in CAPS all you like, it does not refute Arrhenius 100 years ago or the various measurements in atmosphere, cryosphere, ocean showing AGW. The carefully-collected evidence (names, times, events, discrepancies in Bushbama reports against laws of science) about who did 9/11 is demonstrable; allegations about some great AGW funding conspiracy need an equivalent degree of factual proof and there is none. Further, none of you people are attempting to collect it, which is quite different from the 9/11 or GFC cases. That is, unlike in the 9/11 movement, “AGW follow the money” frauds have no persons of extensive relevant education and experience on board (compare Dr Robert Bowman for 9/11). I can read your crony Cockburn on the topic of AGW from dusk till dawn, he never comes near Richard Gage of 9/11 Architects as regards logic and evidence. Thanks so much for the belly laugh! What Ms Perps, on 31 October 2010 at 10:49 AM Said. The climate change “debate” illustrates the basic fact that human civilization does not control its ultimate fate. What will actually happen to this planet is something that can only become known after the fact. Perhaps its surface will indeed become like that of Venus, bone dry, superheated, and sterile. One thing that is nearly certain is that a day will come when no more human beings walk on the earth. In terms of how long the universe has been around, extinction of humans is just around the corner. Perhaps somewhat later the biosphere as we know it will lose its stabilizing mechanisms and cease to exist. All this is, of course, in the natural progress of events, and nothing is to be done about it. About 3 posts containing at least some of the working from my 15 March entry are extant on the web. My idea is hardly original, of course. Nor is it empty-headed. Members of the climate change lobby, besides pursing lifestyles as dirty as anyone else’s with respect to environmental health, have yet to propose any useful ways for preventing global warming by means of public policy. This is not really their fault, but reflects the fact that public policy, which is driven by various parties who seek self-interest, cannot “solve” this problem. The global warming movement is straight science fraud. And its getting in the way of peoples understanding of the climate. No doubt there is an absorption-scattering effect. But its a humble background thing and yet its made out to be the entirety of weather-climate itself. No-one serious has ever stuck his neck out to quantify what part of the 33 odd degrees anomaly this effect is. The whole thing is being done on a “god-of-gaps” basis. The left being too dim to be able to think of other factors that may be making up this difference. I challenge anyone to prove the above statement wrong. Billions of dollars and we don’t have that anomaly divided up and quantified with any sort of rigor. Or any sort of reasonable non-rigor. But Galaxian. If we are able to re-establish an egalitarian capitalism, and shake off our banker and public servant oppressors, we can deal with real, rather than imaginary climate problems. As the climate got hotter, apart from a shield, we would ionise the water vapor in the air, in order to make it rain around noon. That would give us cloud cover at the right time and send latent heat out into space. Thats a powerful argument smokey. Now do you have any evidence that could justify the global warming fraud? …. given that the 30’s was the warmest decade? Or are you just going to sit there with egg on your face? Try to make your lies a little less obvious, old chap. I came to this website by following Barry Brook’s eminently sensible comments on nuclear power stations (at least, I thought them so). But the “irrelevant anyway” part of the Q&A assertion is, I think, wrong too. The arguments here are perhaps more subtle, but I think they go to the heart of AGW, the IPCC report, and the computer models. One of the essential ingredients of the IPCC analysis, and hence of the computer models, is that the only allowance made for solar variation is in the observed direct irradiation (TSI – total solar irradiation). This tends to vary by very small amounts, and hence the amount of climate change attributed to it is very small. This in turn allows a large proportion of observed recent global temperature increase to be attributed to CO2. The MWP (medeival warming period) is actually very important for the following reason : If the MWP was indeed as warm as, or even nearly as warm as, today, then it cannot be explained by any (IPCC-)known mechanism. In particular, it cannot be explained by changes in solar irradiation. This becomes especially important when the LIA (little ice age) is brought into the picture, because the LIA was clearly associated with a period of low solar activity. In other words, a warm MWP invalidates the IPCC report and the computer models. How does it do this? There is nothing in the IPCC analysis or the computer models that supports such a warm MWP. One possible explanation for a warm MWP is that the sun has more influence on climate than by direct irradiation. Another is that there was an unknown mechanism operating. Either explanation renders the computer models invalid. wrt the first possibility – “the sun has more influence than …..” – there is another important argument. We know that TSI has not changed enough to generate the recent global warming on its own. If the sun was indeed responsible for a substantially warm MWP, then there must have been some other component of the sun’s output or some other factor reacting to TSI. But if that is indeed the case, then much of the recent global warming COULD have been caused by solar variation. The different treatment of solar variation and CO2 in the IPCC report is interesting. The possible existence of a solar factor other than direct TSI is dismissed out of hand (there is a reference to GCRs (galactic cosmic rays) but it is dismissed as “controversial” then ignored). On the other hand, the IPCC report claims a massive “positive feedback” from clouds, without which their calculated climate sensitivity is untenable. Yet they present not a single shred of evidence that such a “feedback” exists. Even worse, they repeatedly state very explicitly that they do not understand clouds. BTW, my understanding is that CO2 does have some influence on global temperature, but that the IPCC has grossly exaggerated it. The effects of solar variation have similarly been grossly underestimated. I would also argue that we have all been unduly conditioned to regard global warming as bad, when the reality is that there are tangible benefits to a warmer climate – and the period of global cooling which we appear to be entering is likely to demonstrate this reality in a rather uncomfortable way. I also note that my recent comment, having been initially marked “awaiting moderation”, has now disappeared. It addressed “Q&A” point #8 and was soberly and (IMHO) scientifically argued. I hope that this is all inadvertent. Fortunately, I have a copy of my comment, and will send it again. I apologise to Mark Jonas and any others whose posts have been carelessly deleted by me (not Professor Brook). I neglected to check which thread their comments addressed and assumed it was the current thread about the Fukushima reactor. On this basis their posts were sent by me to Trash for Professor Brook’s appraisal as I believed they had violated the comment policy re Relevance to the thread. In my defence I was up until 2.30am last night and am a bit bleary- eyed after moderating practically non-stop over the last 6 days. Moderator – thank you for your explanation, and I fully understand the pressures on moderators. I’m not lying you are. The 1930’s was the warmest decade. This is one reason that the global warming movement is so obvious a case of scientific fraud. Far more transparent than Piltdown Man (just by way of examination. This is the first time the proponents of a scientific fraud have ever demanded belligerently that they be allowed to use rigged data. We just haven’t seen a movement like this before. No-one here can bring evidence to bear that the 30’s was NOT the warmest decade, except by the insistence that its okay that they use rigged data. Sure Mike but you cannot prove that. So you ought not be saying it. You don’t have the data. Its a reasonable assumption to make, but in science almost half of the reasonable assumptions that one might make turn out to be wrong. So don’t humor these people. Extra CO2 may be a net cooler on balance. You don’t have the evidence to say otherwise. You only have the cause to claim that the effect is slight either way. Perhaps the moderator could explain why I was just moderated. Someone claimed that I had lied in error. He had lied. And this filthy anonymous cowards comment is still there, whereas I am here under my own name. If this liar won’t show his name that makes the moderator responsible for his comments. I will not be called names by some anonymous liar, and then when I respond, be subjected to moderation. Either remove his comment or I will be taking action. Thats okay as a wager. But you ought not say this sort of thing since you don’t have the data. Extra CO2 could be a net cooler. Thats what you would think by looking at the ice core and temperature comparisons. If you look at them with fresh eyes and without bias you might guess a negative feedback. That CO2 may be a net warmer sounds like an informed guess but in science almost half of the informed guesses turn out to be wrong. 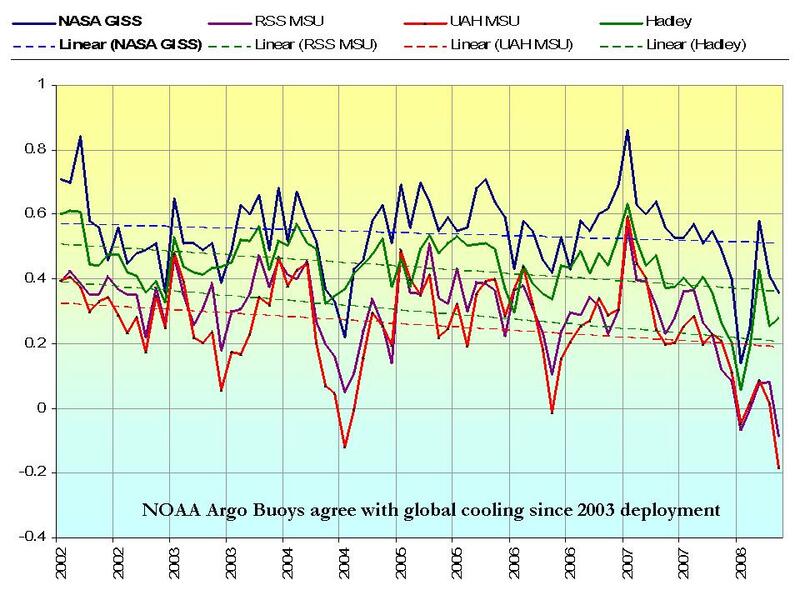 If you are looking at the Goddard or Hadley data, you would perhaps think that CO2 had a beneficial warming effect. But then its not okay to use rigged data. So are you going to produce that evidence? You see this is incorrect. The conjecture was there. The evidence, was, and is, missing. I keep refreshing, your story keeps changing, and is not consistent with what happened. But thats okay. I’m just letting you know that an anonymous fellow, insulting a non-anonymous fellow, and then the latter being unable to respond ….. well that ought to be considered a pretty serious offense. We have to look at what is and what isn’t decent behavior in this new communications environment. graemebird : you have objected in 2 different ways to my statement : “BTW, my understanding is that CO2 does have some influence on global temperature, but that the IPCC has grossly exaggerated it…..”. Maybe I should clarify that “my understanding” is meant to indicate a personal opinion, and that by “exaggerated” I mean “overstated” without pejorative implication. But if you read the main body of my last comment, you will see that the facts and arguments that I have presented do in fact provide some support for the idea that the IPCC has overstated climate sensitivity. On that basis, I think my “understanding” was worth giving. It is actually based on a lot more evidence, but it would have been unreasonable to try to put all the evidence into the one comment. Science isn’t about belief though is it. Supposing you were to practice introspection. What do you think has brought you to this belief? Could it have been the malign influence of dirty data? Is it that you know the data is dirty but you cannot help but factor it in anyhow? You see in science you ought to know why it is you think something, and not just know which tribe you are affiliated too. I swear I cannot tell whether the CO2 is a net warmer or a net cooler, And I’m looking at the same internet as you. I suspect net cooler but other times I’ve thought about it the other way. Its just hard to know how anyone comes to the clear belief that its a net warmer. I myself lack the gift of second sight so I wonder how such a conclusion is reached. That a trace gas could somehow cause energy transfer in a one-way direction contravenes the second law of thermodynamics. For a longer argument, see . Physics seems to have no traction, because people can’t understand it. There is no scientific doubt that temperature measurements are incomplete, biased on land by airports burning jetfuel, and extremely limited in timescale. Geologists know hundreds of millions of years. Temperature measurement has 3 decades. Politics is not science. Hidden commercial and personal agendas drive narcissists. Re: blous79 (2011 Mar. 20). That the trace atmospheric constituent carbon dioxide causes the earth’s surface to be warmer than it would otherwise be is not contested by physicists or atmospheric scientists. The 2nd law states that the quantity change in entropy, equal to heat flow divided by temperature, must be nonnegative in system + environment. Hence, a glass of water will not release heat into a warm room so that the water freezes. The earth receives heat from the (very hot) sun and radiates heat into (very cold) outer space, so no violation on the 2nd law is entailed. We don’t want to be tarring everyone with the same brush. Even bipartisan ideas have to be proven. Where is the proof? Certainly we don’t seem to see it looking at Mars. More CO2 per cubic centimetre and still hatefully cold. Are we to assume that death valley is only as hot as it is due to the CO2? After all there isn’t much water vapor there. Where is the evidence for this if so? And how about the difference between the climate on the ground at Gordonvale and the climate at the top of Walshs pyramid. The two ought to have converged if the CO2 effect is logarithmic. But this does not seem to have happened. Has the climate begun to converge between Atherton and Cairns? I don’t think so. Or Raymond T. Pierrehumbert’s “Principles of Plantetary Climate”. No it won’t go beyond me. [ad hom deleted]Lets go over it again. An idea being bipartisan does not make it true. Thats just a fact. Now if you think you can prove Galaxians claim lets have it in your own words. [ad hom deleted]Now we don’t just assume stuff. We don’t say “Oh the physicists agree so the rest of us have to agree.” Thats just unacceptable. So lets have the proof. I would say that unless the CO2 adds to air pressure its not likely to make much difference at all. The reason I say this is that I happen to know that the greenhouse effect has been interpolated on a “GOD OF GAPS BASIS” Do you understand what I’m saying here Benson? Perhaps you don’t. [ad hom deleted]. graemebird, on 22 March 2011 at 2:14 PM — If you don’t care to read this bit of well-understood physics you could, as an alternative, watch David Archer’s lectures which are available on-line. graemebird, on 22 March 2011 at 2:15 PM — The University of Chicago does not share your assessment and neither do I.
graemebird, on 22 March 2011 at 2:22 PM — Firsst read the two books I referenced and also watch David Archer’s video. So far you have only demonstrated that you do not know the history of climatology, which begins with a speculative paper by J.J. Fourier in 1824 CE. graemebird, on 22 March 2011 at 2:22 PM — If you want the last word on this thread, be my guest. No no Benson. You must prove it in your own words. Linking to a restatement of the theory is not any evidence at all. [ad hom deleted]Can you prove Galaxians claim? Yes or no Benson? Please refrain from incivility, ad homs etc. or you will be placed on permanent moderation.This is a science based blog and you will be asked to give references supporting your views. Comment deleted after persistent violations of Commenting policy. Now on permanent moderation. as both appear to be beyond the moderation policy for this fine blog. I have just returned from lunch and have edited Graeme Bird’s comments and given him a warning to refrain from ad homs etc or be put on permanent moderation. Can anyone else back up Galaxians claim? Benson cannot do it. You see its perfectly acceptable to think that the CO2 may cool the surface. May stop it from warming, except to the extent that it adds to air pressure. This is an entirely acceptable theory. And it will remain that way until someone is able to quantify just what part of the 30+ temperature anomaly is due to greenhouse and what is due to other reasons. Since the greenhouse effect was merely interpolated on a GAPS-basis it follows that if other energy sources are discovered the estimated effect of greenhouse must diminish. Nothing in that dummy Raymonds book can possibly undermine this reality. Moderator — Thank you for your prompt attention. I (and I am sure mnay others) appreciate your dedication. Why is this still there? This is an unprovoked insult by someone who doesn’t understand the subject. Now get rid of it or I’ll ring Barry up and complain to him personally. Don’t try to bully me. I am an un-paid volunteer and I have a life to live.I can assure you that you have no more sway with Barry than anyone else on this blog. Your outrageous ad homs are hardly the same as someone imputing you may not understand something. However, in the interests of equality I have amended that post. Now – play nice or go elsewhere. We don’t have the proof that an atmosphere, free of carbon dioxide would be noticeably colder. That the physicists make this claim does not make it so. We have a temperature anomaly of 30-something degrees. How much of this can be put down to greenhouse. Until we have an clear answer to this question we cannot be saying things like ” all physicists agree…” and pretending that this is some sort of scientific statement. The amount of energy we get from electrical transfer may rival or exceed that from light alone. Can you quantify the proportion of the temperature anomaly due to greenhouse? As requested, I am reposting here in the “sceptics” corner… as if being a sceptic is something antithetical to good science. It’s interesting to me how easily the denizens of this site accept the “consensus” on AGW, which is in reality quite controversial (but highly affected by political and policy-biased agendas)… while at the same time carefully guarding a scientific perspective on nuclear issues against all opposition. When I first looked into the AGW issue, I was quite surprised at how easily a person with an open mind and a willingness to carefully examine the evidence would find evidence that brings pause about AGW. I was NOT expecting this! I will here provide references for a few of the “sceptic” things I have found rather compelling…even shocking (to me) when I first saw them. My general sense (and my point related to the other thread): we must all be very careful both about being fooled ourselves, and about assuming everyone else is just dumb about the topic we think we know intimately. Bottom line: humility is a Good Thing when it comes to climate…and all of science. 1) The IPCC scientists themselves are not as certain as we’ve been led to believe. A measure of this is LOSU, the Level Of Scientific Understanding. Of the 15 major IPCC topics, half (7.5 of 15) were rated “Very Low” LOSU at the end of scientific input. Then the managers took over. By the time the science had been summarized for policymakers and the public, NONE of the topics were rated Very Low in LOSU. This is nicely summarized here (p. 11, Table 1 and text) but you can look it up for yourself to verify. 2) Arctic Treelines are a long-term indicator of climate. There is much evidence that the arctic was warmer (as much as 3-4C in some areas, overall close to 1C) than today in historical times…and not just in small localized areas. Harvey Nichols is an expert on this subject. Here is a summary he wrote, referencing nine journal articles (Nature, Science, Quaternary Research, etc.) He provides evidence suggesting treelines were hundreds of KM further north than today. And here is another overview with more detail (and also more speculation about possible attribution — take the speculation with a grain of salt of course). There are a number of sources for this material around the world (they have a pretty complete picture circling the entire arctic); the Finns are well known for their research in this arena, for example. One such reference: Kultti, Seija, Kari Mikkola, Tarmo Virtanen, Mauri Timonen and Matti Eronen, 2006. “Past changes in the Scots pine forest line and climate in Finnish Lapland: a study based on megafossils, lake sediments, and GIS-based vegetation and climate data,” The Holocene 16,3 (2006) 381-391. 3) Similar to the fears of radioactivity, climate alarmists promote fear of glacial melt, as if the glaciers have been stable for millenia. One of the most compelling sets of evidence for me in this arena is the ongoing series of revelations about material showing up, as glaciers melt in the alps. See here, for example. A (translated from German) popular article highlights even more compelling material. Bottom line: good evidence it has often been warmer than today in the last few thousand years. Well have fun with it. You may or may not find these as compelling as I have. You decide! If I am a denier, you are a climate change “punch drinker” and no amount of reasonable arguments to the contrary will convince you that a half degree change in global temperature is irrelevant in the history of the earth. You continue your chicken little warnings over changes so miniscule there are arguments whether there is any real change at all. And to go on to blame the change on man and CO2 emissions is really beyond the pale when 1) man only contributes 5% of the CO2 generated on whole, and 2) water is a much bigger player in controlling light and heat absorption by the atmosphere. Please read the commenting rules before posting again. The Sceptics and various Open Threads have slightly relaxed rules but you must always “play the ball, not the man” and courtesy is a pre-requisite. See link below to the commenting rules. John, on 16 April 2011 at 10:50 AM — Talk to some Inuits about that. ice forms and ice melts! If you would like to brush up on AGW scepticism here are 900 + peer reviewed papers you can read. They have increased by about a hundred since I last gave you the link. I’ve just read my way through all the comments and must say they are all very interesting and mostly produced by intelligent minds trying to find solutions for a formidable problem. However …. I get the feeling that the whole global warming issue has become a huge money making business …on both sides of the issue. i am in total agreement that a remedy for our insatable need for electrical energy/transportation/industry must be found in forms other than the burning of fossil fuels which are bound to run out one day. At the same time I have a problem with the co2 emission = global warming. No doubt any emission of any kind must have an impact on the environment in one form or another, but to say that the burning of fossil fuels is 100% responsible for global warming isn’t quite right. The whole solar system has warmed up a tad over the last few decades, and being that this planet is a part of the solar system common sense tells me that we’re going to experience a bit of a warm up too. There are a lot of great minds out there working on this problem as evidenced by the comments and I’m sure that soon a ‘solution’ will be found ….. and hopefully it will be one arrived at without any form of confrontational aggression….. Personally I feel nuclear is the answer, but it needs work. Thank you for your posts, always interesting……. Comments on this thread are now closed.